Adisa Banjoko is on a mission. That mission is to combine three interesting artforms and create an international phenomenon. Banjoko's idea of bringing together, hip-hop stars, martial artists and chess players is a novel idea and provides a platform for discussing a plethora of socio-political issues. It is already understood that chess is being used as an educational tool; rap music is very influential and can be used to capture the attention of a young, mass audience; martial arts is not only the current craze in American cinema, but has been popularized by a burgeoning video culture of the youth. All three of these cultural artforms have a lot in common in that they deal with opposing forces. In an earlier interview, Banjoko states, "Our purpose is to encourage young people across the country to infuse their artistic and physical gifts with chess tactics and strategies to enrich their lives for years to come." The Chess Drum's Daaim Shabazz interviewed Banjoko and he revealed more detail about the Hip-Hop Chess Federation and his vision. 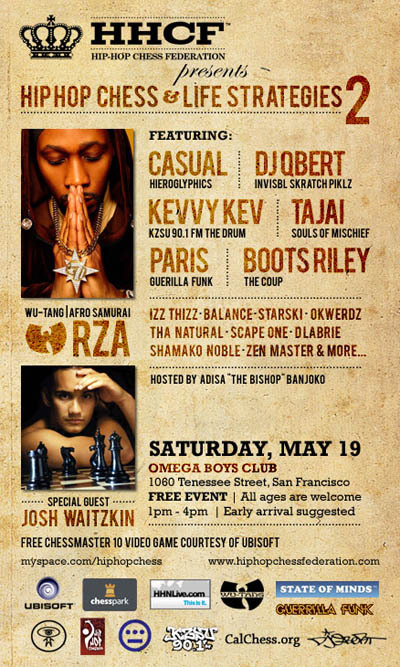 This interview comes weeks before his 2nd Hip-Hop Chess Tournament on May 19th. THE CHESS DRUM: Could you first tell The Chess Drum audience a little bit about yourself. Where are you from... education? BANJOKO: My name is Adisa Banjoko. I was born in the San Francisco, California and grew up just outside of San Francisco in a city called San Bruno. Not long after my 19th birthday I moved to Oakland. But I have lived in San Jose for a little more than a decade now. I'll never leave the Bay… well, maybe for Barcelona! 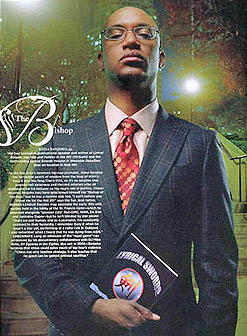 My pen name is The Bishop of Hip Hop. I've been writing about Hip Hop since 1987. When I was in high school, I was lucky enough to interview a not yet famous Eazy E. I never stopped writing. I self published Lyrical Swords Vol. 1: Hip Hop and Politics in the Mix, as well as Lyrical Swords Vol. 2: Westside Rebellion. They have everybody in there from Russell Simmons to RZA, and Maurice Ashley to Styles P. I've led a wild life. One I feel blessed to have been given. As far as education, I have a GED (general education diploma) and a few junior college credits. Not much to write home about. However, on my own, I have read enough books on theology, philosophy, politics and music to be invited to lecture at various universities that include Harvard, Brown, Dickinson, Stanford and many others. I hope to get into a university soon and eventually get a Masters in Political Science or Journalism. TCD: Where did you learn chess and how did you become involved? BANJOKO: My father taught me chess when I was about five. I always played with friends. Never competed though. I'm OK. I enjoy the lessons I got from chess more than the nuances of openings and the deeper essence of tactics. I guess that's a long winded way of saying I'm kinda lazy. BANJOKO: My son is eight and he's actually pretty good. He has a good mind and a creative spirit that can express well on the 64 squares. My daughter is just learning. She's five. I believe once she settles into the game that they both could have a great future with the game. TCD: Tell us about your background in hip-hop? BANJOKO: I used to rap. I started as a DJ in 1983. Then I began rapping about 1985. Over the years I have done shows opening with everybody from Gangstarr, Organized Konfusion, R. Kelly (who knew he was so ill??) Onyx, DJ QBert, Mix Master Mike, De La Soul, Paris all kinds of people. I used to be an acquaintance of Tupac Shakur prior to his days with Death Row. I've seen and been a part of some of the best years that Hip Hop has given the world. TCD: Tell us about your journalism and activities in the hip-hop world? BANJOKO: I was one of the first west coast writers for The Source, but I also write for Vibe, XXL, Grappling magazine and Yoga Journal, On the Mat, and Allhiphop.com among others. If you throw my name in YouTube you'll find a few clips of some of my lectures. TCD: Besides the hip-hop musical genre, what are some of your musical influences? BANJOKO: I was raised on Jazz, Reggae like Bob Marley, Israel Vibrations and Burning Spear. My parents are from the South so, the music of Howlin' Wolf and BB King are a big part of my life as well. I love all music though. Over the past 5 years I've really gotten DEEP into Classical music. I really dig Beethoven and Vivaldi. TCD: How did you come up with the idea for the Hip-Hop Chess Federation? BANJOKO: The Hip-Hop Chess Federation was founded by myself and Leo Libiran. He's an old school graff writer from the Bay Area. Over the years we saw how Hip-Hop, Chess and martial arts were so connected. One day on the phone he was like "Yo, we should start a federation man". The next day, we were up online and running. 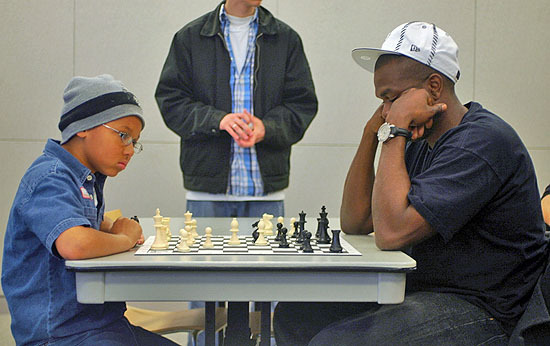 TCD: Who are some of the most famous chess-playing rappers and hip-hop stars? BANJOKO: Oh man, the list is long. You basically have two eras of chess and Hip Hop blending. I'm actually working on a film with Mike Relm (DJ for the Blue Man Group) on the subject called 64 Squares in the Cipher. But essentially, political rappers like Public Enemy, X-Clan and deep lyrical rappers like EPMD opened the door in the mid to late 80's. At that time, it was a natural extension of the socially and politically charged art that it was. When the gangster vibe became more popular, it looked like it was going away… but then came Wu-Tang Clan. RZA, and GZA especially. They brought it back but using the board as a metaphor for surviving on the streets. It was beautiful what they did. But really, lots of rappers play chess. Its like Hip-Hops intellectual dirty secret. Paris, Griff from PE (Public Enemy), Dead Prez, NYOil, Immortal Technique, Dilated Peoples, The Coup, Mistah FAB, Balance, Izz Thizz, DJ QBert, DJ Yogafrog, DJ Kevvy Kev, Barry Bee from the Get Fresh Crew, The Educated Rapper from UTFO, Casual, Saafir, Tajai, DJ Muggs its always been there! I'm just trying to formalize and organize their natural intellectual expression. GZA and Muggs have an album dedicated to Hip-Hop and chess called "Grandmasters"- it's a classic. However, please note that some of the content is not for kids. We're still taking about life that comes from the streets. That's why the momentum of these events have gotten is just exploding. I love it and I'm happy that I trusted my vision and that Leo and I have had so much support from so many great people. TCD: Do any of them play in USCF tournaments? Have they ever expressed a desire to do so? BANJOKO: From what I can see, no. Some of these dudes are raw. But they keep chess private. I assume though that we'll see that change in the coming years. I think Kevvy Kev, Barry Bee and maybe Will Smith could really bring some heat though. "It (hip-hop) is in a state of mass confusion. What most people see on TV is not what real fans of rap music listen to. Its really unfortunate. The guns, violence and mistreatment of women are not what REAL Hip-Hop is about." TCD: Do you feel that rappers can help the United States Chess Federation market chess? BANJOKO: The problem with a lot of chess organizations is that they preach to the choir. There are tons of kids who have never been introduced to chess and all of its beauty and power. But nobody is trying to do any real outreach. At the same time many of the chess programs that do exist are poorly funded- so its hard. The HHCF is trying to breakthrough all of that and unite young minds who need chess with those that already possess its wonder. 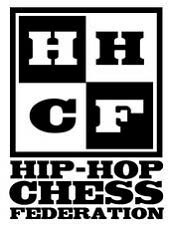 TCD: What does the founding of the Hip-Hop Chess Federation mean for the Black community? BANJOKO: It means chess will no longer be a thing for just the kids from the burbs. Don't get me wrong. I'm from the burbs. My parents were real poor but they worked hard to get out of some tough areas. But not only Blacks are in need. American schools are failing across the board. How will our children learn about patience, problem solving, critical thinking, short and long term planning if we don't give them chess? The time is now. TCD: What is your five year vision for the HHCF? BANJOKO: I can't give it all away just yet. But I plan to have the HHCF established around the planet as a racial, religious and cultural unifier. In fact, I'm recruiting for an official HHCF team right now. I want four boys and four girls who are ready to shake up the planet. Leo and I have major plans. This is only beginning. TCD: Who has been your biggest influence in chess? BANJOKO: In the beginning, my dad. Now, its my son and my daughter. Funny how life is. But I must give honorable mentions to Josh Waitzkin (who is coming to our next event on May 19th) Maurice Ashley and Susan Polgar and her family (who never gets enough credit). TCD: What is the current state of rap music both nationally and internationally? BANJOKO: Its in a state of mass confusion. What most people see on TV is not what real fans of rap music listen to. Its really unfortunate. People will tell you they love Hip-Hop and know Hip Hop but they have never heard Rakim, T K.A.S.H., One Be Lo, Okwerdz or Outlandish. They have never seen a b-boy jam or watched a DJ battle live in person. Hip-Hop is so rich. The guns, violence and mistreatment of women are not what REAL Hip-Hop is about. The media often gets it wrong, that's why I'm so grateful that guys like Daaim Shabazz exist. That's no joke. 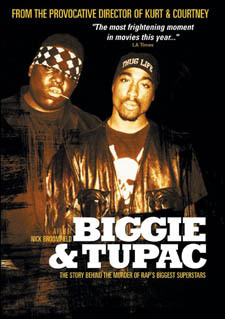 TCD: In your opinion, who was the better rapper... Tupac or Biggie? BANJOKO: I'm a bonafide westsider… (laughing)… so you know how we do here in the Bay!! No honestly, Tupac was not the best rapper in the world. What he was best at though, was sharing his emotions on wax. I compare him to James Baldwin because of his ability to articulate Black pain so effectively. No one could ever match his artistic drive and his honesty. Even if some of his truths had dark sides, you had to respect his honesty. I believe his story, is one of a genius… ignored and abused. I still have not really gotten over his death. Again, we were acquaintances, not best friends… and he had many flaws, but when his light would shine in your presence, it was awesome. Biggie was lyrically better than Pac. What he lacked though, was any socially uplifting lyrics. He had no "Brenda's Gotta Baby," no "Keep Ya Head Up". So, unfortunately while he had an edge style wise, I think Pac's legacy is greater because of his love for the poor. Lyrically he is one of the east coasts best ever. Him and the Wu had to rep the east damn near alone. 'Cause most everybody else fell off until Dead Prez, Blackstar, and Immortal Technique. Nobody can front on that. BANJOKO: I want to thank you from the bottom of my heart for taking interest in what Leo Libiran and I have put together. I want to thank all the Hip Hop, Chess and martial arts fans around the world for their support. I want to thank people like Josh Waitzkin and Ubisoft for their help in contributing to the mission of the HHCF. We are bringing our events to juvenile halls and prisons. We need help buying books. So, if anybody can help with that please hit me at www.myspace.comhiphopchess. I also want to thank Dr. Alan Kirshner of Calchess.org, D'Lamont Robinson of Academicchess.com, Davey D, Hip Hop Congress, hhnlive.com, Thembisa, T'mor, young Mecca and my beautiful wife Mieko for all the help they have given the HHCF. I get most of the props. But a lot of beautiful people help the HHCF manifest these events. These don't happen all by themselves. God bless you all. Feel free to email me at bishop@lyricalswords.com. One Love!